With this, I am starting a new series of blog posts to point my readers to artists I know and respect. Many of the artist’s I currently follow are part of the twitter community and may well be known to each other and to you. There are a few artists that I came to know from before twitter (yes there was a time) – particularly from the WetCanvas on-line community and this artist is one of those. 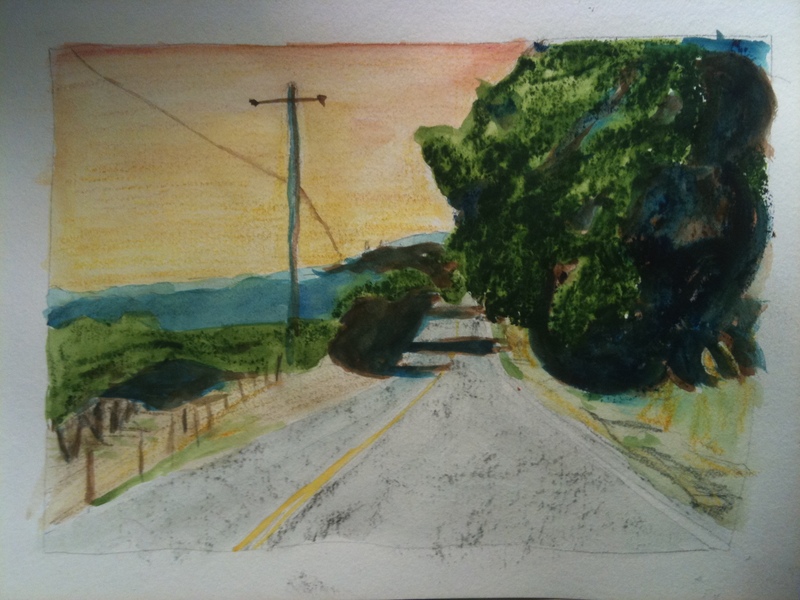 The artist to introduce you to is California painter William Wray. He often paints what I would describe as gritty, urban landscapes. It is not uncommon to see industrial factories, gas stations or downtown canyons. He has also made compelling works with car, trains and shopping carts as the subjects. Wray’s unique style is also applied to some still life and figure painting. His subject matter often makes his work distinctive but so is masterful use of color, light and shadow. Words can’t really do justice so please visit his website and his blog to see his works and to learn more about him. Be sure to also look for the links to a couple of books he has of his paintings. I paint with oils and acrylics and have used many other media. I have however never really tried one of the most common and popular media – watercolor. Today that changed. I did up five sketches in watercolor. 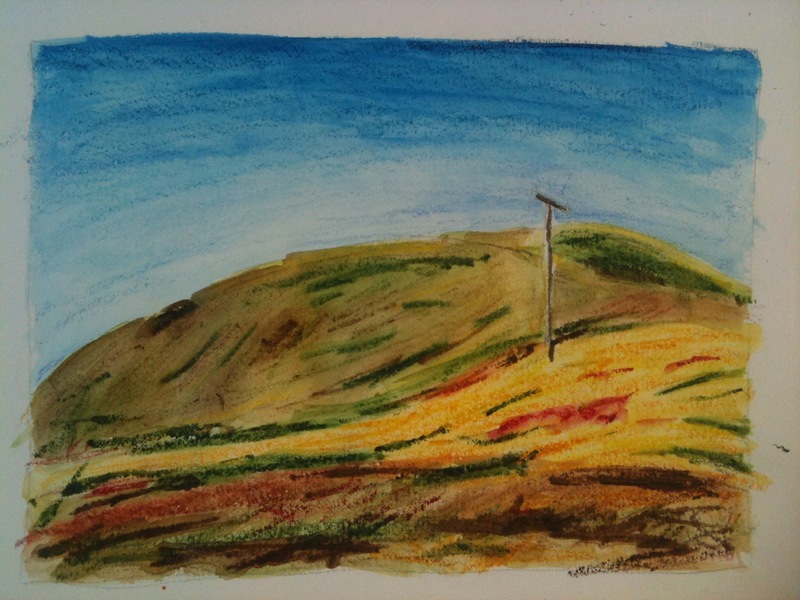 I wasn’t using the common forms of watercolor – in pans or tubes. 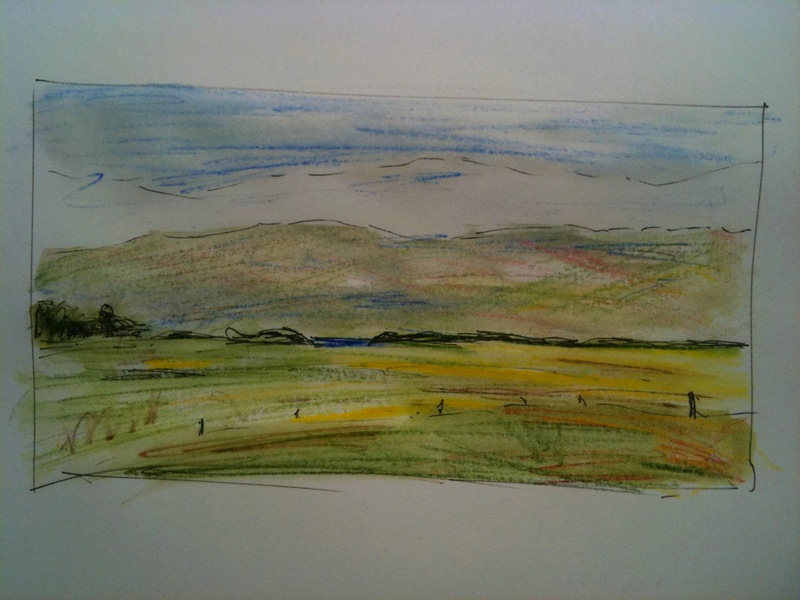 What I worked with are water color sticks (from Daniel Smith). I experimented with a few different techniques. In the first sketch I started with an ink drawing before adding the color. From the second sketch on I did basic drawing with a pencil, even shading with the pencil to establish a bit of value toning. I also tried different ways of applying the watercolor: drawing with a dry stick and later brushing with water, drawing with a wet stick and pulling color off the stick with a wet brush and then painting on to paper in a traditional fashion. These first three sketches were done in a standard sketch book, probably about 80lb paper. The size of each image was around 5×7 inches (13 by 18 cm) . 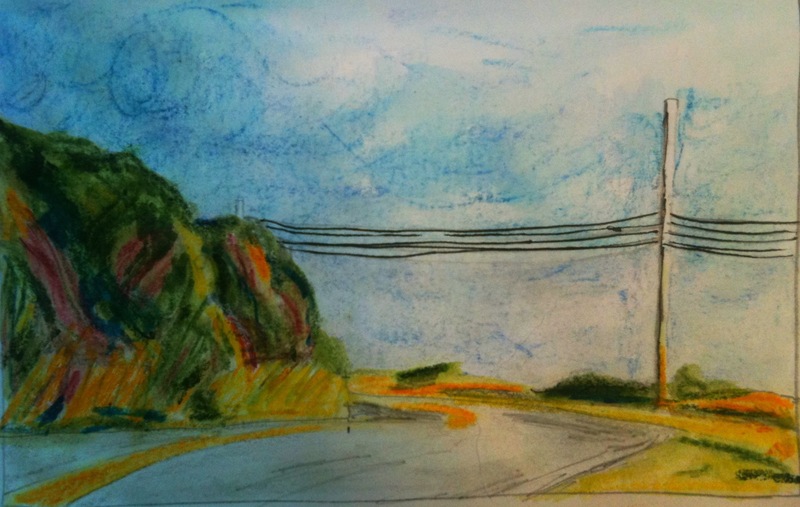 My last two sketches were a little larger and done on130 lb paper (more suitable for water media). 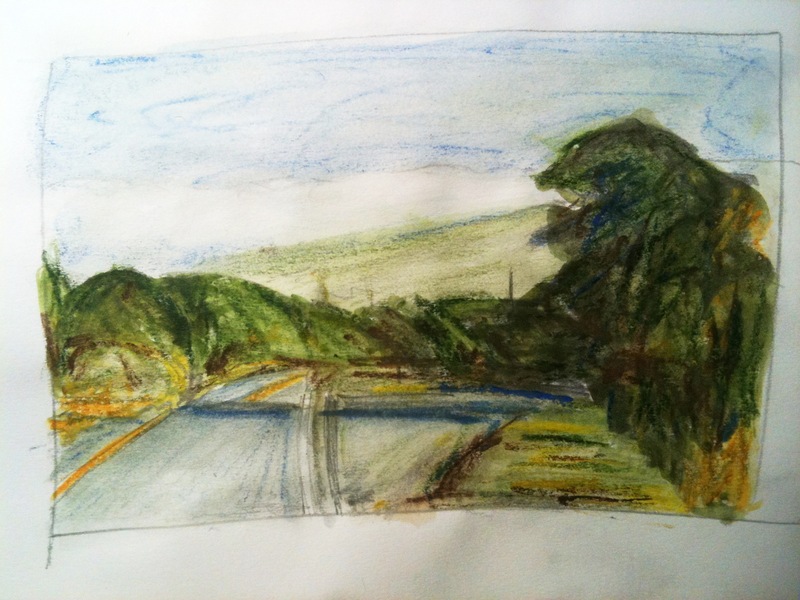 The landscapes I used for these sketches are from a series of photos I took last July while on a drive along the coast, north of San Francisco. I plan to develop a series of paintings from these landscapes but the point of this exercise was primarily to get familiar with the media rather than work out compositions and color schemes. I don’t expect watercolor to become a dominant media for me (but never say never). What I like about these watercolor sticks is their portability. If I can develop an ability to handle them to create the way I want to, they will be ideal to take with me while traveling. I’m thinking they would be great to pack along while cycle touring.